In the a cyber futuristic world where humanity has embraced the enhancement of technology, cyber terrorists are a thing. The first of her kind artificial solider with a real human brain Sergeant Major. Becoming a apart of sector 9 who specialists in dealing with cyber terrorists, comes to deal with a smart one. That makes her question of being and can major trust the people who she works for now? In no way has myself gone down the path of “So now your reviewing all of what is popular game” before your mind wonders to that assumption. Ghost in the shell as of yet regarding the anime series I’ve not had the pleasure seeing all of. So far having only seeing the laughing man saga, this was my first introduction into the series. Had planned on purchasing all that was available on physical release to start from the beginning. Recently noticed in my store Ghost in the shell 2017 was already out. Shows how behind with the latest releases. When it comes to buying movies never seen before, getting physical copies of, don’t mind going in blindly. It is what happened here also good friend Taku was a influence as from reading his review on it, made me take the nose dive. Some have been dying to know my thoughts, just adding my two scents to the Ghost chain. When the announcement of this live action for the franchise, most people at the time were hating on it already. It’s the way it usually rolls if certain actors, actresses aren’t chosen. All the nick picks. In this case we got the whole “White washing saga”, which if you don’t know means casting actors/resses who are casted as non white characters. Mainly for popular or historic titles regarding more. The backlash of whitewashing aimed towards Scarlet Johansson playing Main role Major. Personally this made me really excited to see her in another role like this which reminded me her role in the movie Lucy. “No asian actress, what….. ain’t watching this crap now” something along these lines heard at the time. Instant hate yet the film wasn’t even released, my god how touchy the world can be even more. In no way this posts I’ll be referring back to the original source much expect for this part regarding Major. After seeing this film and scarlet in action as Major happy to see from my perspective, wasn’t disappointed. Scarlet captured how I imagined. Major might be portrayed, like this lost child, unknown to so many things. Slowly unraveling herself the truth in her being and deciding to continue as she is or find a new purpose for herself. Scarlet Johansson has this nag for roles with only so much life in them best way to describe and her as Major was believable to me. That’s all that matter regarding her role, made me feel that major is more than just a shell but there is human underneath. If by some miracle you end up buying Ghost in the shell for your dvd collection recommend watching the extras that are on there. The following video is from the DVD of the cast, writers talking about the themes and philosophy that ghost in a shell explores. 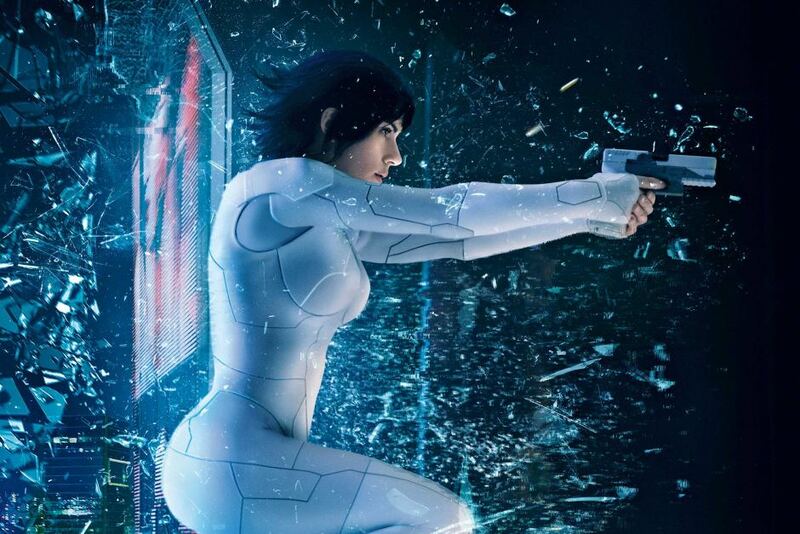 Ghost in a shell explores two important, relevant themes that connects it’s viewers in a personal sense, no matter their interpretation of the film. Both in the anime and this film it’s not changed as Major being the focal point of memories being the only thing to define us as individuals. If relying on photos, letters imagine them being erased, we might question if we really existed of who we are. This is such an interesting concept Ghost in a shell explores, this is something never noticing when watching stand in alone complex. Not till seeing this film and extra behind scenes interviews did it all become clearer in what was wanted relayed in this film. The shell representing a vessel and ghost your soul, your real self. Major such a conflicted character in showing this concept that self discovery in yourself, is a long journey. My interpretation of all this was self discovery is indeed in the things we say, do but the memories is only an hourglass in the person you were back then. To how you maybe now. Self discovering is a continual thing and that to keep moving forward with. It’s on a exaggeration in the futuristic look of Ghost in the shell but the second theme it explores is about technology itself. How technology interconnected we are in this day and age, how much we rely on it than ever. My interpretation from the film was a little scary look at how much technology could involve and be much easy for hackers. To hack into your personal information. Dont think it was the film’s idea in this conception to be scary but certainly my interpretation. 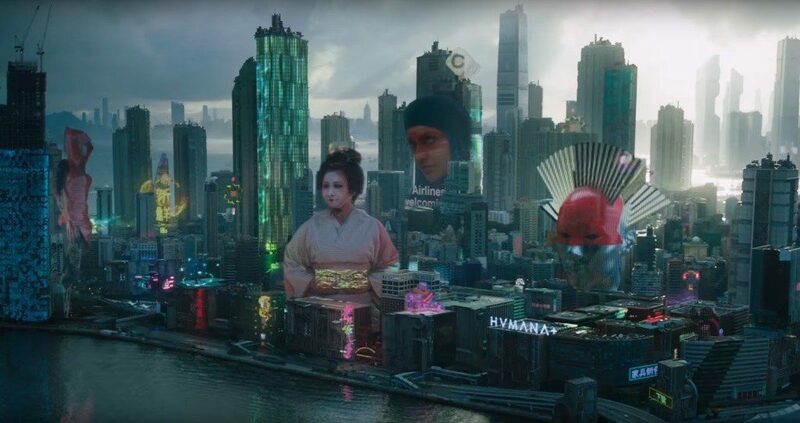 If there was a grounding standout for Ghost in the shell it’s the visuals, props EVERYTHING. 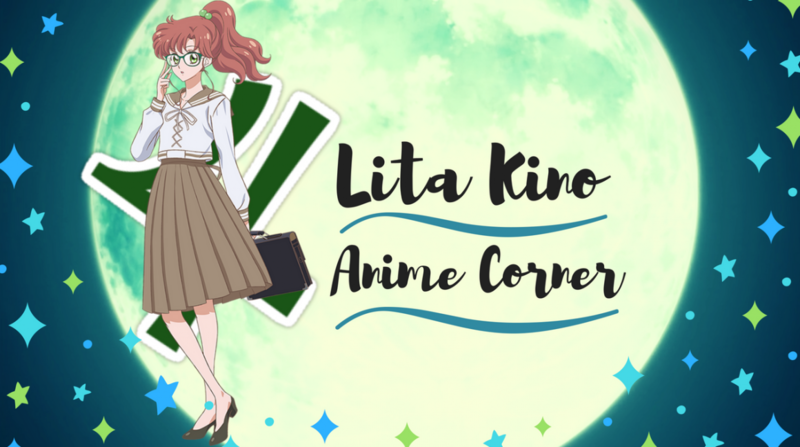 While the plot feel is weak in expanding it’s main themes more, visuals will keep you glued to the screen. My eyes were glued can tell all the effort that went into the production to give us that futuristic look. Mean the first few minutes with the Geisha doll had me feeling weirded out, How long would it have taken to make one of those…. seriously? I’d never want a statue of that. Set in such a cool, advanced setting, glimpse into a possible future for even our reality. It’s not one I’d like to live in as next thing you know will be having human conversations over 3D phone calls. Could be but all round appealing visuals that gives the film a big lift, Without them feel the film would have a much weaker stance. Big Question: Is it just a forgotten Ghost or worth remembering? This post did not want to turn into a drag a thon about this film, as feel many reviewers and others have already done that. With all their rant pieces which in fact tired of seeing nothing but negative. Ghost in the shell for me was a interesting, enjoyable but average watch best to put it. That’s sum up my negatives about the film as still enjoyed it more than thought I would. Ghost in the shell is a film that explores the deepness of identity and self worth that viewers will be able to relate to in a sense. A great diverse cast of actors who bring from the original series their own flare, in believable role. It’s a sci fi flick that don’t think you’d regret watching but others have apparently. It’s one of the better adaptions from an anime, that I’ve been excited and keen for. It’s a film from all the actors, writers want people to build up their own interpretation, Ghost in the shell isn’t the worst of the worst. That others have made it out to be unwatchable, it’s stands up on the pedestal next to the original source material but has it’s own originally. This was a really refreshing watch for me honestly. Ghost in the shell gives exposure to the masses into Japanese animation….. well it could you know. Please comment below your thoughts about 2017 Ghost the shell. Interested to know the good or bad issue you had with it. I won’t ask you to hold back. I’ll see you all in the next post then!! I actually did not really care too much about the whole controversy over the casting, mostly due to indifference. That being said I did not watch the move because when The Avengers was a huge thing an annoying fangirl made me hate the movie and Scarlett to where I refuse to watch anything with her out of principle. I imagine the movie is done well though, but I’ll never see it due my own madness.